A few months ago I had an illuminating conversation with the other mothers at playgroup. We were talking about how much we spend on food. It was amazing how different the range was. And it reminded me that it’s been ages since I wrote about the financial side of cooking. Convenience is expensive because the more processing (and especially packaging) a food goes through, the more it costs to produce. So it’s best to cook things yourself where possible. Baking your own bread or making your own yoghurt or even your own wine vinegar are excellent places to start. I find that apart from the financial benefits, home made food often tastes better. Plus it’s generally better for you because you know exactly what ingredients were used to make it. We all know that animal products tend to be expensive. If you do find cheap meat, you’ve got to question why it’s so cheap. Interestingly, in my playgroup discussion it was the ‘mostly vegetarian’ family who had the lowest monthly food costs. There’s no need to turn completely vegan overnight. Try going meat-free a few times a week. Another great option is to decrease the amount of meat in a recipe by supplementing with lentils, beans or even tofu. Or think of ways to use a little meat as a garnish to keep the carnivores happy without the cost of a steak. Years ago I read a study comparing the nutritional content of ‘fresh’ and frozen veg. In many cases the frozen veg actually outperformed the ‘fresh’ vegetables. Especially when the non-frozen veg were on the older side. Like more help reducing your food costs? Then check out the ‘Mastering the Art of Cooking on a Budget‘ program at the Stonesoup Virtual Cookery School. The program is ‘pay what you can afford’ and I created it as a chance to help people who can’t afford my other programs. While cooking real healthy food on a budget may seem difficult, it’s not impossible and in this class I’ll show you exactly how to do it. Along with Fergal’s Fried Rice, this is one of my backup quick dinners for my boys. I usually have cooked pasta in the freezer so all I have to do is remember to defrost the pasta a few hours before dinner. 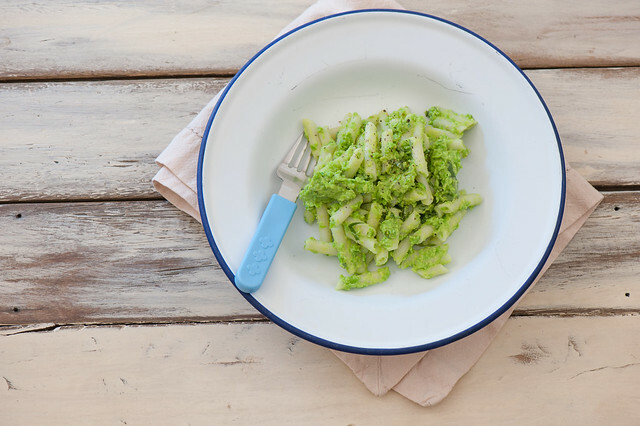 This has the added bonus of reducing the impact of the pasta on our blood sugar because the cooking and cooling process creates ‘resistant starch’ which our bodies use as fiber – something especially great for gut health. 1. Bring a big pot of salted water to the boil. Add pasta and set your timer according to the packet directions. 2. Meanwhile, warm butter in a small saucepan on a medium heat. Add peas and cook for a minute or until the peas are hot. The less cooking the fresher everything will taste. 3. Remove peas from the heat and mash using a stick blender or a fork until you have a chunky saucy puree. 4. 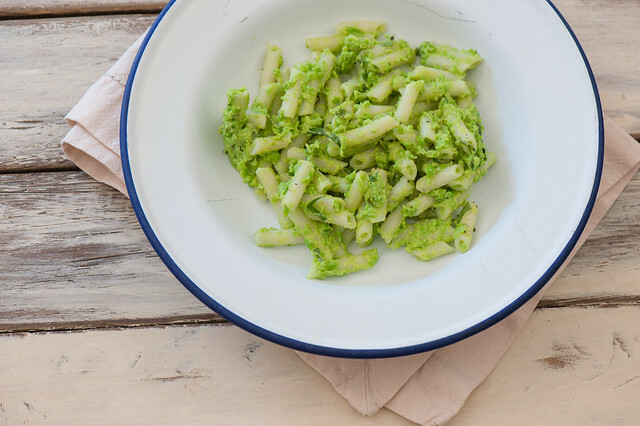 When the pasta is cooked, drain and toss into the peas along with the mint and 1 tablespoon lemon juice. Taste and season with more lemon, salt and pepper if needed. cheesey – serve with lashings of grated parmesan or toss in crumbled feta or goats cheese. different herbs – replace mint with basil or parsley. less mess / one pot – cook pasta and drain then make the sauce in the pasta cooking pot. more fiber / more veg – soften an onion or leek in the butter before adding the peas. Toss in a few handfuls of baby spinach or cooked greens with the cooked pasta. low-carb – replace some or all of the cooked pasta with spiralized zucchini (courgettes). more substantial – use more butter, or more pasta or serve with roasted nuts such as pinenuts or almonds. dairy-free – olive oil instead of butter. carnivore – serve the pea sauce with cooked sausages, roast chicken or BBQ lamb chops. 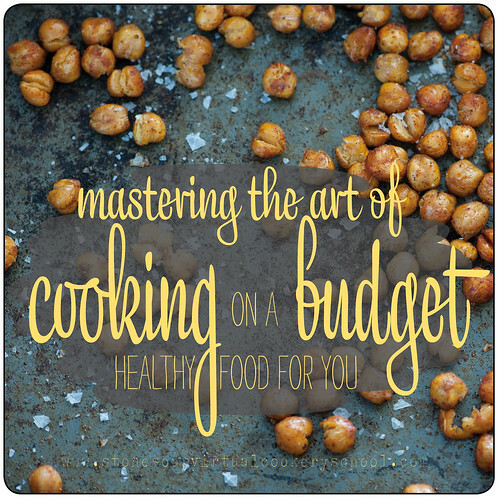 Like to learn more about Cooking on a Budget? Then I highly recommend taking the ‘Mastering the Art of Cooking on a Budget‘ program at the Stonesoup Virtual Cookery School. ps. I can’t guarantee I’ll be able to keep offering the class as a ‘pay what you can afford’ so signup today to make sure you don’t miss out on this great deal. I recently started using frozen veggies, after avoiding them for fresh ones for so long, and love the cost saving but also the fact that I never waste any. I was forever throwing out veggies that went off before I could use all of them. Yay for frozen veg Chris! Agreed, cooking from scratch will make a huge difference in your food budget , i compare my spending now that i go grocery shopping on regular basis to the time that i was eating out most of the times, and the difference is really impressing! It makes a huge difference Laura! Thank you so much for offering this. I’m really starting to appreciate how much you can save by cooking from scratch! I’ve become a little obsessed with building our meals from the absolute ground-up (much to the chagrin of my hubby who often gets stuck with the dishes). It’s a lot of fun and kind of empowering too! Hi Jules, could I ask you how you store the pasta in the freezer? Just made this – wow, super awesome and super simple. This one is a keeper. I put parmesan on top and it was fab. Thanks for your simple, but delicious ideas. So glad you liked it ginny!